Kunming is a city known for its sleepy nature and a perfect climate that promotes a casual urban way of life. In many ways it offers an alternative to the busy competitive nature of China’s first and second tier cities. As the capital of Yunnan province, the city also prides itself as a peaceful melting pot of ethnic unity in one of the most ethnically diverse areas of the world. 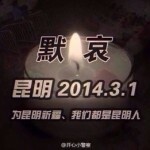 The Spring City’s reputation was irrevocably changed on the evening of Saturday March 1 as a group of five to ten knife-wielding attackers entered the Kunming Railway Station and engaged in a stabbing rampage that killed 28 passengers and wounded more than 100. The Chinese government is labeling the assailants as a Uyghur separatist terrorist group although very little is known of the actual identities of the assailants and their motives. This horrifying incident is the bloodiest in recent memory to occur outside of Xinjiang, a territory that has seen an increase in restive ethnic activity over the past five years. The domestic Chinese media and international media are providing plenty of coverage of the incident, but many questions remain unanswered and facts surrounding the incident are sketchy at best. Most importantly, who are the assailants? 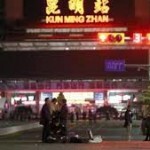 Why was Kunming and its train station chosen as a site for the attack? And how could security at the train station be so lax to permit this unprecedented violence? Official reports confirmed late Saturday evening that security forces killed four of five assailants and apprehended a fifth female attacker. In the firefight one or more of Kunming’s SWAT force was injured with undisclosed levels of injuries. Phoenix TV reported three of the assailants fled northward on Beijing Road (Kunming’s central north to south thoroughfare) out of the train station and continued to stab innocent bystanders until they met a police blockade several hundred meters from the station. Two were shot on sight and one apprehended, allegedly a woman five months pregnant. Photos show the assailants were wearing the same black head to toe uniforms and were said to have their heads covered. 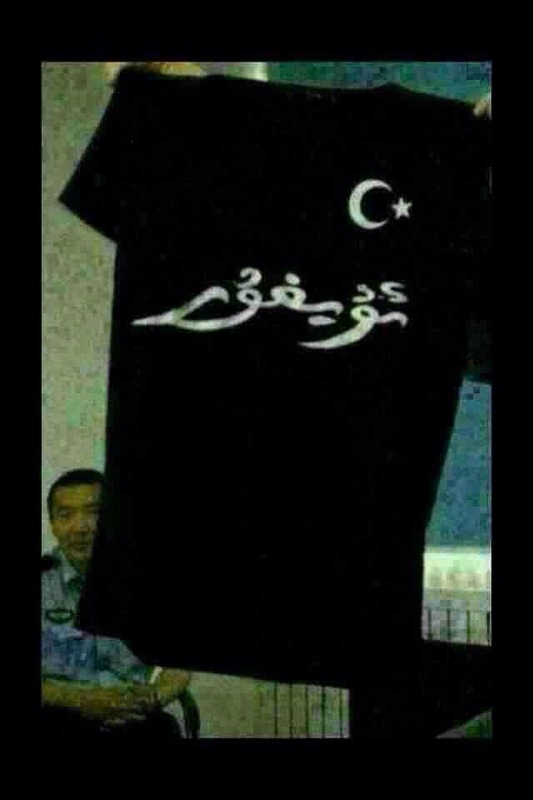 Early Sunday morning March 2, photographs of a short sleeve black t-shirt with a crescent moon and Arabic script began to circulate Chinese social media channels; the t-shirt was the alleged uniform of the attackers – however, photos of the apprehended and assailants killed on site suggest they were wearing long sleeve shirts. On Sunday morning March 2, the official Chinese media labeled the incident as a terrorist attack laying the blame on Uyghur separatists groups. At the point of this publication no names, photos, or information on the assailants have been released to the public. Identifying the assailants as Uyghur did confirm the initial messages that hit popular Chinese social media channels around 10pm on Saturday evening. Concerned Chinese citizens are calling for the release of information on the assailants by the public security forces, but due process in China does not require the release of such information. It is possible that we will never know the true identity and motivations of the attackers. At noon on March 2, a list of 11 Uyghur men with names and headshots began to circulate Chinese social media sites. The men are labeled as suspects fleeing the scene of the crime and no information has been released about their specific connection to the incident. Were these men identified by close circuit cameras in the train station? Were their names divulged by the apprehended fifth attacker? Were they simply men who failed to show up to work on Sunday and reported by their Han Chinese employers as missing or by local observers as suspicious figures? Again Chinese criminal and legal processes help to shed little light on the identity of these men who apparently are still at large. Kunmingers are in a state of fear and disbelief as news of the incident unfolds. Of the few people interviewed by ExSE most state that it is important to stay indoors since suspects were still on the run. The municipal public security bureau has asked all housing complexes, public venues, and university campuses to increase security surveillance methods. Property management companies of housing complexes are encouraging residents to blanket report sightings of any Uyghurs to local police stations. Photos from the Kunming No. 1 Hospital located in the center of the city show the wounded recovering in gurneys, occupying hallways in the already crowded and resource strapped facility. A Sina Weibo user reported in an unverified report that a migrant family cannot afford the 50000 RMB required for treatment of their critically injured child. Chinese train stations are often crowded and packed with passengers into the late evening as passengers board overnight trains to destinations throughout the country. Kunming’s station last night was no exception. The mix of people in the train station was likely comprised of various walks of life from migrant workers, to middle-class tourists, to foreign backpackers heading to the popular tourism destinations of Lijiang and Dali as well as points north in inland China. One photo showed a bag of golf clubs against a wall towering above a pool of blood. 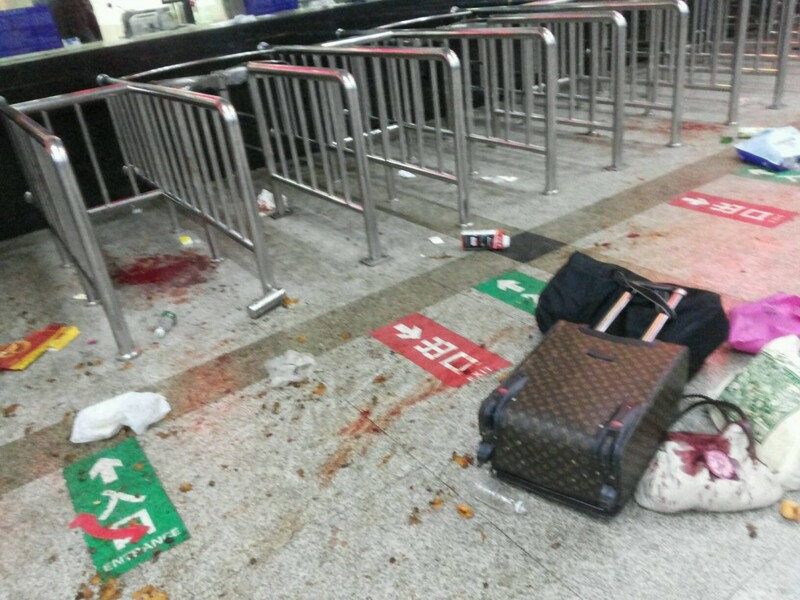 Gruesome photos of the scene also show luggage left strewn throughout the scene of the violence, a rampage that occurred in many of the stations waiting halls in addition to the main ticketing room. Anyone who travels on China’s rails and bus system knows the security at train and bus stations is extremely lax. Poorly trained guards – really hired help in shabby blue uniforms – man posts at metal detectors and luggage scanners placed in station entryways more for show than to serve a security purpose. At peak times train and bus stations are much more crowded than airports in China and metal detectors are constantly sounding as passengers walk through without any recourse or further pat downs. With the exception of Xinjiang and Tibet were security has been increasingly tightened over the past five years, the quality of procedures to safeguard the security of public places wanes as one gets farther away from Beijing. Perhaps the known factor of a lax security environment and a municipal government famous for slow responses and public relations nightmares made Kunming an easy target for the assailants – if they were as the official Chinese media claims from western Xinjiang. We are all still grappling to understand why Kunming was chosen as a target for an attack of such scale. 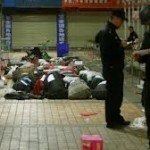 The last time an incident of this nature – although admittedly we are still trying to figure out the exact nature of the incident – happened was a series of two bombings in 2008 when a local man, a former convict disgruntled and unable to find a place and job in China’s competitive society bombed a bus killing two and then unintentionally killed himself in a second bombing inside the popular Salvador’s Café in the city’s university district. The two incidents were spread out over a five month period. Prior to the bomber’s death in the second December 2008 bombing, authorities blamed the first bombings on Uyghur separatists until they could forensically link the two incidents. The bomber was Hui Muslim but not Uyghur and religion ties or ethnic suppression were not revealed as motivations for the incident. As the city begins to piece itself back together with the start of the work week tomorrow, ExSE will continue its discussion of this horrible incident, continuing to comment on official media response, the discussion of Uyghur separatism and its link to the incident. In addition to the broader topics above which the mainstream media has already defined as its main narrative surrounding the incident, ExSE, a Kunming based website is interested in exploring issues on the ground here in the city as they unfold and from a long term, more connected perspective. With so little information released on the true identities of the assailants as well as the identity of those slain in the attack, how does an urban society process and respond to such a violent incident? We are also curious and concerned to the way an urban society heals from the shock and grief that now holds sway over Kunming and to what effect security will be raised in the city in both the short and long term. Importantly how will the ethnically diverse but general peaceful and non-restive ethnic groups of Yunnan respond to an attack labeled with ethnic motivations by an outside separatist group? And will angry Chinese nationals seek retaliation against Uyghurs and Muslims in all patterns of ethnic and nationalist tension that are becoming more and more predictable in China? Please feel free to leave comments to this post or if you have contributions, contact us at eastbystheastmail@gmail.com. Thank you for this article. It feels both well researched and deeply sentimental. I am looking forward to to following as you continue your conversation about this tragedy.